Make sure every detail of your special event reflects the elegance and grace of the new couple. Our pen holder is the perfect accessory to your guest book table. 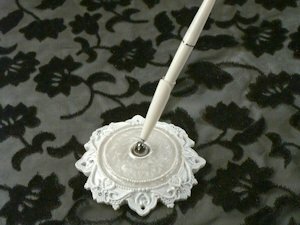 It is accented with lace like scalloped details and perfectly place crystals and holds the included pen - standing 8" high. Each set comes gift boxed.